Recovery from addiction does not come in an instant. Just as the children of Israel did not return to the promised land in one day, so we cannot find peace from addiction in a moment. In his book Return to the Promised Land, Rev. Grant Schnarr provides readers with a detailed description of spiritual growth, a journey based on the biblical story of Exodus. Return to the Promised Land is about the parable of the children of Israel’s struggle to become a nation—a symbolic representation of our own lives. Not merely a loose correlation between the history of a people and our own personal lives, each significant person, place, tree, rock, body of water, and stick in the hand has a specific spiritual meaning that corresponds directly to our spiritual growth. Even as God did not abandon His people so many thousands of years ago, He does not abandon His people today. He leads each one of us, if we let Him, to happiness and inner peace. I will spare you my war story with alcohol, but I will tell you that I decided to get help. Three months after being ordained as a minister, I woke up one morning and decided to quit. I didn’t want alcohol to interfere with my efforts to be helpful to others. I got help through Alcoholics Anonymous and began my journey from the slavery of addiction. Leaving the addiction of alcohol behind was a relief. But finding peace in the wilderness afterwards was a difficult task. I found other potential addictions: addictions to work, love, food, and even counseling. One by one these enemies presented themselves, each in their own way. It took a lot of spiritual labor and combat to remove these barriers to having a happy and healthy life. Through the search for wholeness and my own “promised land” I found Him. God, as I understand Him, lifted me up time and again, and protected me, fed me in my wilderness search, and brought me to spiritual recovery. I now enjoy this recovery one day at a time and thank God for the help He gives me every day. And the journey continues. May you learn a great deal about your own spiritual journey from these descriptive biblical stories, from their deeper meaning brought to light by Emanuel Swedenborg, and from my own experience with pain, with growth, with life. Preceding each chapter are biblical passages that are later explained. You are encouraged to delve into their symbolic meaning in your own life. Each chapter begins with a quote from a work by Swedenborg and ends with simple, practical exercises intended to help you put your newfound knowledge into immediate action. 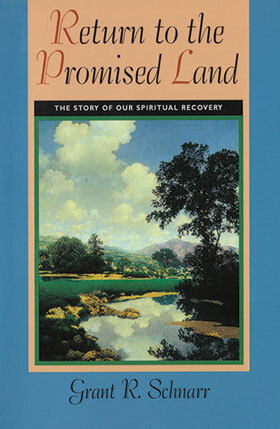 Return to the Promised Land can help guide you from addiction to freedom, from spiritual hunger and thirst to being filled and satisfied,from the fury of inner spiritual warfare to lasting spiritual peace. By Rev. Grant Schnarr, a New Church minister. He has led seminars on recovery, spiritual growth, and men’s issues for more than twenty years. To learn more or to order his books, visit www.grantschnarr.com.